The Aruba Tags app, like the Aruba Beacons app, is used to deploy and manage Aruba Tags. Aruba Tags are used to track assets on a map. Tags can also be used to track assets that aren't on a map. Asset Tags are used for asset tracking as part of a real-time location system (RTLS). 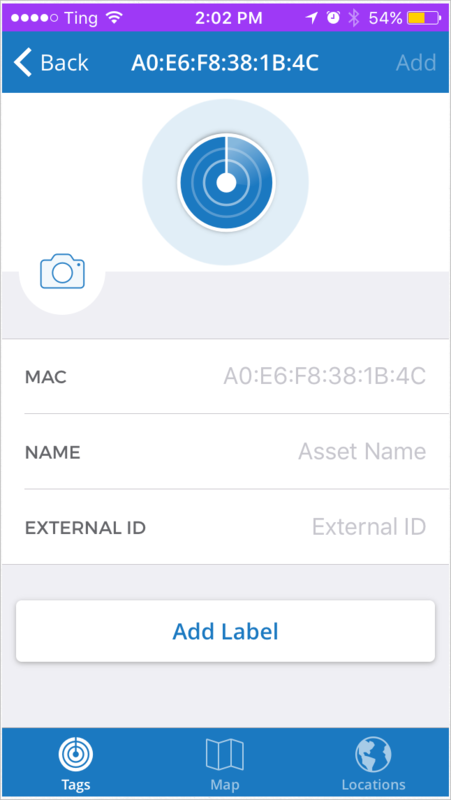 Once an Asset Tag has been deployed using the Aruba Tags app, the tagged asset can be tracked on a map using the Aruba Tags app, the Meridian Editor, and the Meridian SDK. In order to disambiguate Aruba Tags and their assets, names, external IDs, and labels can be assigned to each Asset Tag. Photos or images can also be assigned to Asset Tags. The Tags View lists all of the Aruba Tags that can be detected by the Tags app. 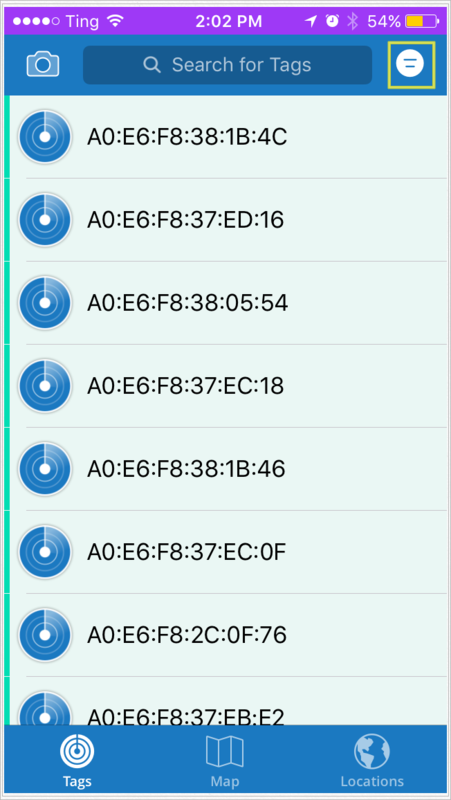 The top part of the list highlighted in green are Aruba Tags that are detected by the app, but haven't yet been placed on a map. The white lower part of the list are Aruba Tags that have been placed on a map. Pull the list down to refresh it. Tap an Aruba Tag in the list to add or edit it. 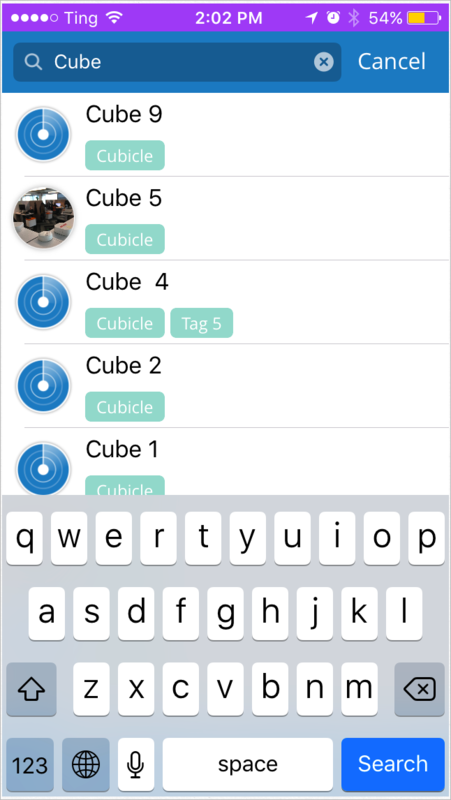 The Tags app uses the Bluetooth signals from an Aruba Tag to identify the Tag being added to a location. The QR Code Scanning method for adding Tags has been replaced with Tag Scanning. On the Tags screen, tap Add. 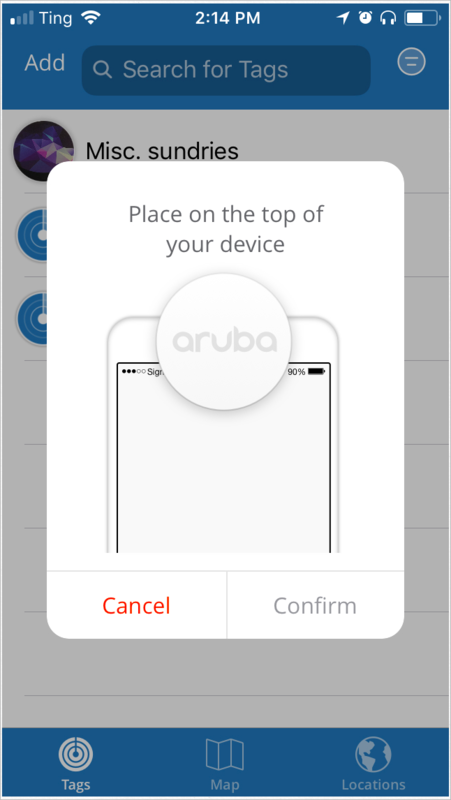 Make sure the Aruba Tag is turned on, and then place the Aruba Tag on the top front of the your device. Tag Scanning can take 1-5 seconds to register the Aruba Tag. When the scan is complete, tap Confirm. The Tag is added to your location. 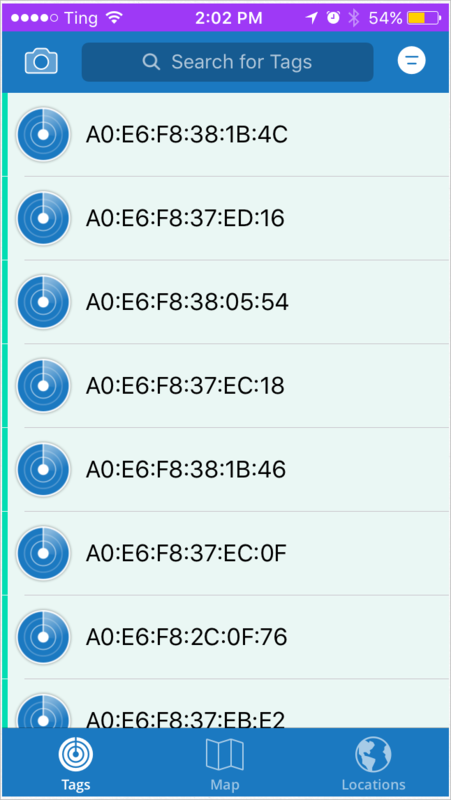 The Tags app lets you search for Aruba Tags by MAC address, name, or label. Partial MAC address searches work as well. There are times when you may want to focus on Aruba Tags that haven't been added to an asset. Tap the filter button to hide placed Aruba Tags. Tap the filter button again to reveal placed Aruba Tags. On the Tags View screen, tap an unplaced Aruba Tag to go to the Add Tag screen. Tap a placed Aruba Tag to go to the Edit Tag screen. To get to the Edit Tag screen from the Map Screen, tap a Tag, and then tap the i button. The Add and Edit screens are essentially the same. Before you can Add an Aruba Tag, you need to give it a name. The name should relate to the asset you're tagging. Tap Add to add the Aruba Tag. When you do, if possible, the Tags app will attempt to show the location of the Aruba Tag on the relevant map. 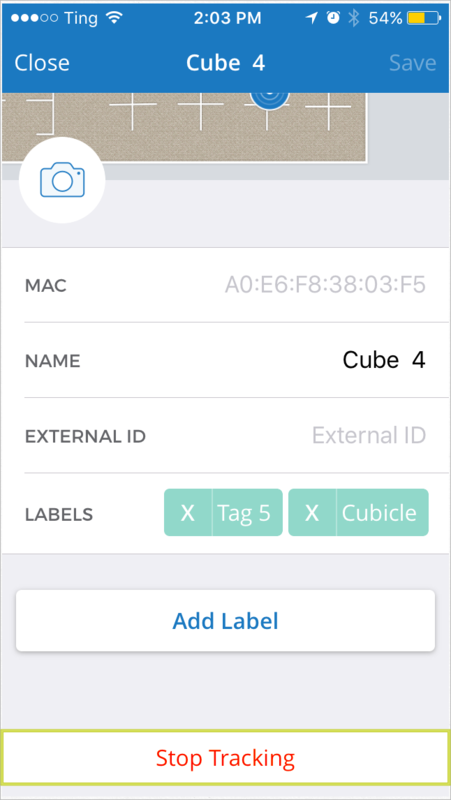 The Tag app lets you take a photo of the asset to which you're adding an Aruba Tag. Choose a picture from your photo library or take a new picture. A thumbnail image of the photo replaces the camera icon. Tap the thumbnail to use or take a new photo. Tap Save to save the new photo. The MAC field is not editable. You can use the EXTERNAL ID field to enter an ID that relates to an ID in a non-Meridian resource, such as an inventory database. Labels are text that you can add to an Aruba Tag to search for Aruba Tags added to specific types of assets. On the Label list, tap all of the labels you'd like to assign to the Aruba Tag, and then tap Done. You can only add labels to an Aruba Tag that have already been added. To add new labels, go to the TAGS page in the Meridian Editor. Tap Save to keep the new label. Tap the label's X to delete it. The Map View shows all of the Aruba Tags visible on the current map. 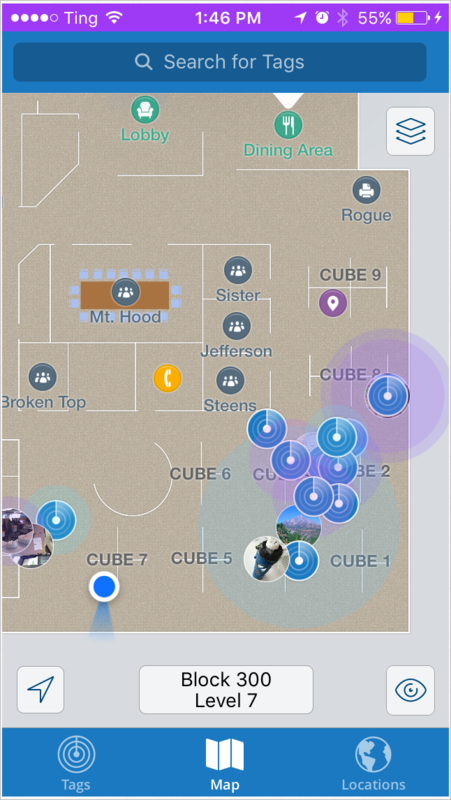 The Map View works similarly to the Aruba Beacons app's Map View. Aruba Tags are represented on the map with circular blue icons. Tap an Aruba Tag icon to see its name and last heard time. Tap the i to go to the Aruba Tag's detail page. To delete an Aruba Tag from the map and stop tracking it, go to an Aruba Tag's detail page, and then tap Stop Tracking. In the Remove Asset Tag dialog box, tap Delete. When you delete an Aruba Tag, you will lose all of the information associated with it. There is no way to undo a deletion, but you can redeploy the Aruba Tag. If you have access to more than one location in the Meridian Editor, use the Locations View screen to switch between them.